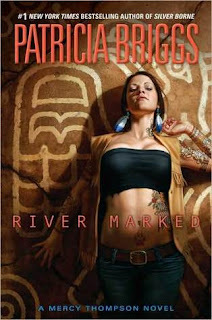 Life is changing for coyote-shapeshifter Mercy Thompson. She is now living with fiance, Adam, the werewolf alpha. And at the moment, no one seems to be gunning for her death. But Mercy wouldn’t be Mercy if she could stay out of trouble. As she and Adam embark on a week-long trip to a campground for their honeymoon, she learns quickly there is more to the vacation than meets the eye. The fae have actually orchestrated the trip, because one of them had a vision that Mercy needed to be there. It turns out there is a monster in the water, and Mercy is integral in the chain of events needed to kill it. While previous installments of this series have focused on the werewolves, the vampires or the fae, this one is really about Mercy’s Native American heritage. About the shapeshifting line she hails from and the magic it entails. I have to admit, some of it was confusing off the bat, especially when we got into who her father really was. By the end of the book, I pretty much got the idea, but it didn’t sit easily with me. I was happy to see the continued progression of Mercy’s relationship with Adam. But I did miss the supporting characters we’ve come to know and love. Sure, we got a glimpse of them at the beginning, but for the most part, they were noticeably absent. Of course, they couldn’t all cram into the RV and go along with Mercy & Adam, but the family of characters Patty Briggs has created –is really one of the best things about these books. I felt its absence. When all was said and done, though, it was a good read. Not the best the series has to offer, but one I wouldn’t miss. 4 stars.